Create Beautiful, High-Converting Order Forms in Seconds! Now, choose a pre-built, high-converting layout as a starting point for your order forms! Use The EXACT High-Converting Order Forms That Top Online Influencers Are Using In Their Business, TODAY! 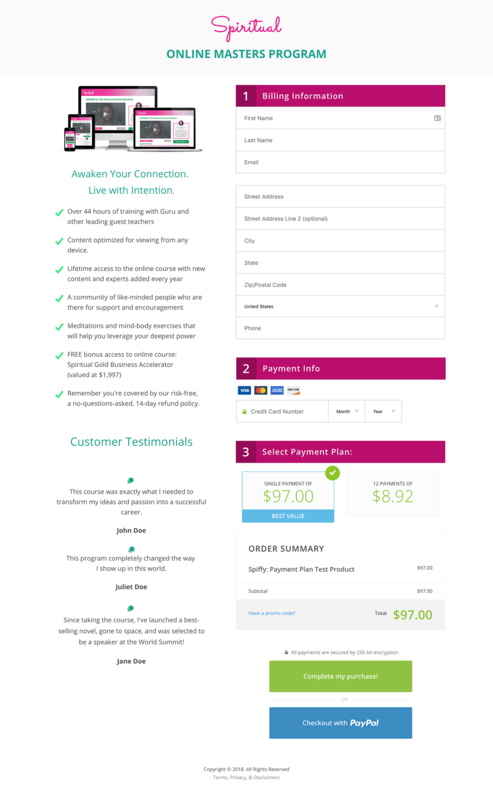 Spiffy has been the go-to solution for Infusionsoft Order Forms for many years now. We’ve always made it super easy to get a beautiful, high-converting order form up and running, fast. But, we’re always looking for ways to make “easy”, even easier – and “fast”, even faster. It’s never been easier, or faster to get a beautiful, mobile-optimized, and conversion-boosting order form up and running for your business. Now you can select from an array of pre-built, proven, and high-converting order form layouts and designs, and use them as a starting point for your order form. We partnered with some of our most influential customers like Michael Hyatt, Eric “ET” Thomas, and others to make the EXACT order forms they use in their business, available for you to use. You will be able to choose between world-class, custom, high-converting order form templates, and put them work for your business within minutes. Not only that, but we’ve designed a few additional templates ourselves based on all of our learnings over the years. Over the past 3 years, we’ve processed over $200 Million in transactions, so we’ve learned a thing or two about what works, and what doesn’t. To use one of the new templates, simply create a new order form within your Spiffy account, and select one of the templates in process of creating your new order form. Want to use the same exact order forms as some of the top online businesses? Create your Spiffy account today, and get your order forms up and running fast with our new Template Selector. Watch and see how to easily create a world-class order form, with the new Spiffy Templates. 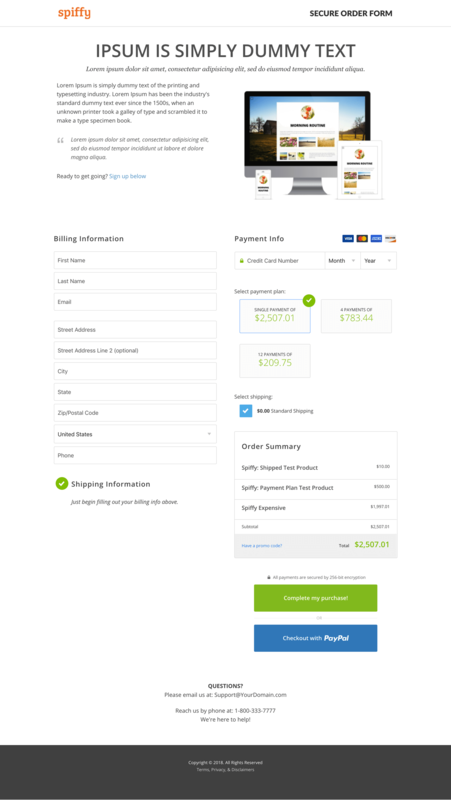 To bring you high-converting, beautiful order form templates. Spiffy just got even easier! It’s now just click, edit, publish – done! Try out Spiffy for 30-days, completely risk-free. 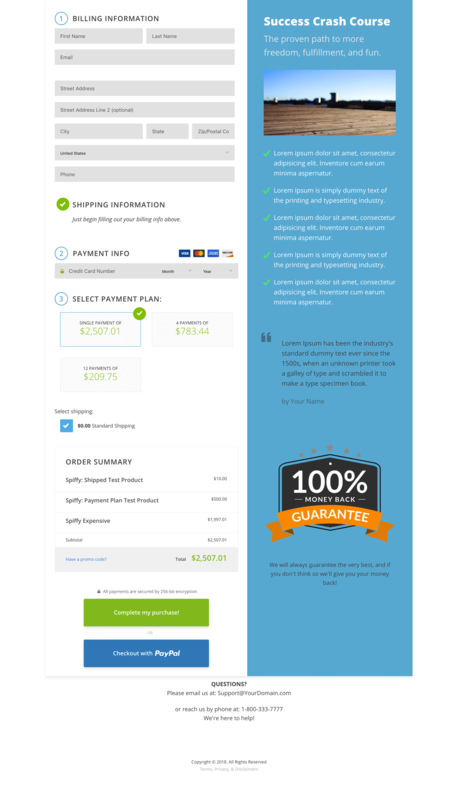 Spiffy comes with a 30-day, 100% money-back guarantee. If it’s not a good fit, simply ask for your money back, no harm, no foul.